I have had better days lately, but the last three days were a little rough. We are moving through them. I am so thankful that I have a family that can be here for me to help me when I am down and have fun with me when I am wanting to get out of the house. I haven’t posted lately and that has a lot to do with how I have been feeling. I have had a lot of bad days. Aaron went to Boston for a week and luckily his mom was able to come out and spend the week with us. I don’t think I would have made it without her. She helped me out with a lot and I couldn’t thank her enough. Then, poor Aaron had to have his wisdom teeth pulled so both of us have been kinda on the lower end of great. But he has been the best, as always. Before, Aaron went to Boston he bought me a scrapbooking desk to put in our bedroom. I have been able to get back my destresser, which is great. What a great gift! I am hoping to be able to scrapbook more soon, as soon as my arms and hands stop being such a pill. I think in my stretching I have over done it and I am paying for it. I am trying to take it a little easier. As Aaron says, he wants me to make a budget of my energy and only pay out to the most important “bills”. We will see how the next couple of weeks go. It started last night, I was watching a movie with Rachel and Aaron. I was laying on the couch and I could feel my body start to tighten up. I felt like I was frozen from the inside out. I went to bed I feeling like a giant bruise and it hurt to move. I hope that a good night sleep would help but no such luck, I am so sore this morning. I plan on taking the rest of the day very slowly and hopefully tomorrow will be better. I just finished the second book, “High Fructose Corn Syrup and the Fibromyalgia Connection: Fibromyalgia Recovery Handbook”, and it was a waste of time! Janice Lorigan, the author, has no connection with Fibro, no medical training, nothing. I think she was just using the book to get people to stop using corn syrup and eating rice. This book was a waste of the money and time I put into it. I hate dead ends. I finished the first book that I ordered, 100 Questions & Answers About Fibromyalgia. There is so much information in those 100 questions it was unbelievable. I learned that I have a muscle and tissue disorder which cause my muscles to ball up or knot and lock in place. I am also hyper-sensitive, meaning that my nerves (and body) take everything a little too seriously. For example, if you give me a light hug it feels like you are crushing me or if you give me some NyQuil I am completely out of the game. I learned that there is no one cause for Fibro but the solution I found while reading that fits my condition is it was most likely caused by my Epstein Barr Syndrome (EBV). EBV is the virus that causes mono; I caught mono when I was about 7, again when I was about11, then when I was 12, and so on and so on. Instead of my body building an immunity to the virus it adapted itself to it. EBV causes many problems for its “victims” but I think this is a big one. I know that my thought train derails a lot and it never did that when I was younger. My dad used to ask me what was on TV for the night, and I would rattle off the TV listings to him or my mom would ask me someone’s address and phone number and I would recite it like it was my own. Now days I can barely remember how to finish a thought. It is very frustrating and it makes me feel very inadequate; come to find out I am not the only one who suffers from this. “Fibro Fog” is the most common complaint with Fibro patients. From reading this one book I do have a few things that I am going to ask Dr. Soloman about. I am wondering if some of my pains and complaints would be caused by interstitial cystitis (IC) or irritable bowel syndrome (IBS). I know those are a few things you probably didn’t want to know but I am being honest in these posts. As I got to the section on the medications and management, I learned that most things related with this section had the side of effect of “may cause weight gain”. Thanks! Here I am trying to control my cholesterol and weight and this darn syndrome is doing everything in its power to stop me. Can’t a girl get a break. I did also learn that as for the meds I am on, they are the latest and greatest. That is a good thing. The writer’s of the book suggested that along with the medications that patients try other therapies. This includes water aerobics (uh…no), message therapist (people touching me, I think not! ), and a psychologist. The psychologist is for teaching you how to deal with life and teach you pain techniques. The book did suggest using a tennis ball for about 20 to 60 minutes as a way to massage a muscle that has a flare up, I think I can handle it. They also state that stress is a big factor in causing flare ups. The book suggests that you find some soothing and calm activities to do daily. Scrap-booking is one of my major stress relievers, and I am hoping to find a way to be able to do it again. The book also suggest that you start journaling how your days are going, what was your pain like and if you had any stress. So, along with what I am learning in my book I will be occasionally posting what my days are like. I started off with about a medium day of pain, but like yesterday my lower back and legs have began to hurt. I have also had a low roaring headache today. Rachel helped with distracting me by taking me to see All About Steve. I recently read a book by Jenny McGarthy, Louder Than Words, and I was inspired by her story of how she became her son’s advocate in understanding and pulling him out of Autism. Last year they finally put a name to the pain that I have been going through daily for the last couple of years, Fibromyalgia. I have a name for it, but now what do I do with it. My doctor gave me some meds that I take daily for pain control and a few stretches to do. And told me that hopefully that if I don’t have any relapses I could be pain free in 5 years. After reading Jenny’s book I decide that what the doctor told me wasn’t good enough. So I am going to become a Fibro “expert”. I have order six books that have an array of Fibro information that I am going to be able drink up and become my own advocate. 3)I have to be my own voice, you can not see my illness. So the people around me might see someone who look perfectly healthy but I am in a lot of pain that at the moment I have no control over. God says that he will never give us more than we can handle, but some times I think that he has too much confidence in me. I have been having to deal with more children than I have been able to wrap my sanity around. I have not been able to keep my house clean so that I or my family can really function in it and I have been going completely pissy on the people around me. In my reality I can not handle what I have been dealt and I going crazy. Aaron had a conference in San Francisco this weekend, so as his trusty side kick I got to go. WordCamp was all day Saturday and they had a Developer Day on Sunday. We flew on Friday morning which was fun. It was supposed to be a non-stop flight to SF, then it got changed to a touch down in San Diego. When we got to SD they said that our flight would be delayed three hours but that they had made arrangements for us all to change planes if we hurried to gate six and then we should be on time to SF. So much for a non-stop flight to SF. We did arrive in SF on time which was nice because we took advantage of the whole afternoon. We found a place that offered a 4 hour tour of The City. In the tour we got to see all the major sites you would normally get to see and then our guide also took us to see some of the great houses of the area. That was a highlight for me, Aaron on the other hand thought that it was all the same. I love the Victorian nature of all the houses and that the more you restore the house the more you really see how beautiful it was in its youth. We also went through all the normal neighborhoods like China Town, Little Italy, and the 60’s Era (that was interesting). While on the tour bus I noticed a bus poster for Spam-A-Lot the play. (The Broadway Musical that I have been wanting to see for years.) Aaron used his nifty knowledge of the Internet and his wifi phone and got us VERY nice seats for that night. YEAH! So after our tour and dinner at L’Ottavo (Thanks, Beth!). We went to see Spam-A-Lot! The play was awesome. It however was not for the morally faint. As with Monty Python nothing is off limits, they’re British. While Aaron was at his first day of his geek fest, I spent my time shopping. I was enjoying my time in the 5 story Macy’s, the 3 story Old Navy, and a slue of other great shops. I did over do it though because I had to spend Sunday in the hotel because my legs we too sore to move. Saturday night there was a WordPress 6Year Anniversary Party. That was Fun. Talk about a range of people. There was a 16 year old kid there was unable to really function that looked like he would get stuck in a locker a lot, a he/she in a goth outfit with a cape and dog collar, a guy named Neil that was about 45 that probably still lived in his mom’s basement that would just not get the hint and don’t forget the guy who brought his dog in his man bag. Don’t get me wrong there were a lot of “normal” geeks there but they just don’t stand out when there is a whole room full of them. Sunday night we went to Ghirardelli Square. We took a cab from our hotel, little did we know that we were riding with the stereo typical cabbie. He was either always on the accelerator or the brake. Once we arrived there unharmed, we found out the square was closed. The restaurant and the gift shop was the only thing left open. And if that wasn’t enough I had also left my camera in the hotel room. At least the food and the view was amazing. Well, to sum up my thoughts on The City…..I was enjoyed it but I was disenchanted with the thought of it. I had always wanted to go and see what it had to offer but when I got there it seemed as though I had seen most of this before. The shops were the same, the night life ended early and the ocean was better in SD. In the end, so far, I like Boston in the fall. We gave Xavier the choice of staying in OK an extra day and having no detours on the way home or we could leave on Friday…he choose to stay. But that doesn’t mean that we nothing happened on our home. We did try to stop at two Rte 66 museums and a honey farm on Saturday but they were all closed. We broke our trip back home into two days so we stopped in Albuquerque for the first night. We had a lovely breakfast from the hotel and then went back to the room for church. It was a great message from Dave Ramsey. After we packed we got on the road, little did we know that it would be like the God was doing yard work. The wind on this trip home was blowing so hard that were hitting tumble weeds like there was no other. It was as though God has turned on his weed blower for the medians and they were cleaning out everything. We were driving in sure high winds that we saw a dining room set whipped out of a truck and slam on the ground in splitters. We also saw motorcycles riding at about a 40 degree angle trying to stay upright on the road. We were just on the south side of the Flagstaff a piece of luggage flew out of a truck and we had no other choice but to hit it. We tried to find something for Xavier to see while we driving home still. 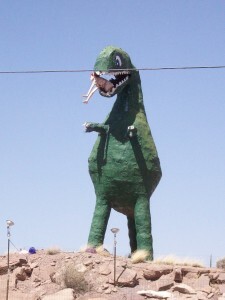 We saw a sign that said petrified wood and a dinosaur museum. Once we got there it had to the most disgusting single wide trailer with an add on that had anamatronic dinosaurs with manikins on them. Needless to say the road trip home was not has much fun for X as it was interesting for Aaron and I. We have been enjoying our time in OK. We have been doing all the normal things like shooting turtles in the pond, riding quads, reading over 400 pages, “hiking”, and other crazy things. Xavier has been outside about 95% of the time. If he is awake we can’t keep him in. He is usually dirt from head to toe. He has been enjoying quads rides with anyone he can convince to take him. We went “hiking” the other day to see some caves and springs. Dave told us that there would be a great cave that had a natural spring coming out of it and you could get to it from the from the trail on the Gator. Little did I know that we have go down a small hill, cross a creek, up the other side, down the other side to cross the ravine and viola we were there. At this point Dave was not my favorite father-in-law. Along the way back to the Gator we all got pretty muddy and Aaron and I each lost a shoe. For St. Patrick’s Day Stacie bought X a bag of green toys. One of the toys was a whoopee cushion. He made a go of everyone sitting on it, even Great Grandma! Later that day he realized that he could make the dog sit so he got Ninja to sit on the cushion. The dog’s face was priceless. I so wish that I had it on camera. As for the other crazy things….DANIEL and Aaron took culverts to the top of the hill and rolled the down in them to the bottom of the field, not once but thrice.